b) I actually managed to stay upright. I'm not very good at doing things which require the attachment of wheels or blades to my body. Ice skates = bad. Roller skates = bad. Roller blades = positively dangerous. Skis = certain death. Some day I'll tell you about how I left a trail of mangled bodies downhill skiing in Italy or how I broke both my kneecaps skating when I was thirteen. As I was saying, I went to the local thrift store to see what they had, and I found these! When I saw them they reminded me of the dishes that my grandmother used for years and years. 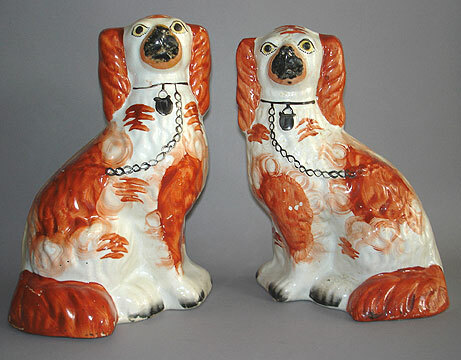 She got them sometime in the 1970's in Staffordshire, England, where we all lived until I was 12 years old. Staffordshire is known for its pottery. I don't like a lot of it, to be honest - especially these dogs which I think are super hideous. When I got home I checked the dishes out on the internet. An identical plate sold for about $8 on E-bay, so I think I got a pretty good deal. I thought briefly about keeping them for myself, but have decided to try and sell them on Kijiji, as I do NOT need more dishes. Even if I sell the lot for $30, I'll have made a 600% return on my investment. (My friend told me that, by the way, so I cannot attest to the accuracy of the math.) Whatever. I'll be ahead of the game, and in the end I'm pretty sure that's what life is all about. I just bought a baking dish that matches those plates & bowl the other day. Love it.